The iconic "toy train" icon was originally designed by Walt Disney in 1948, during the second year of the annual Marine Corps Reserve "Toys For Tots" drive. Ever since then, every autumn, big boxes with red toy trains appear here and there around every town in the country to collect toys that are then distributed to needy children who may not get anything for Christmas otherwise. The Marines pass out the toys to children based on need regardless of any other factor in the immediate area where the gifts are given, which means toys donated in this county probably stay within this county (except in the unusual instance where more are donated than are needed). Despite the crowing of various TV types, most working people are still feeling the ongoing effects of the not-quite-healthy economy. In fact, with ongoing high unemployment, overall prices for everything slowly creeping up, a looming tax increase, and facing another long cold winter, one could say it is bad for business. And in most cases, it is. 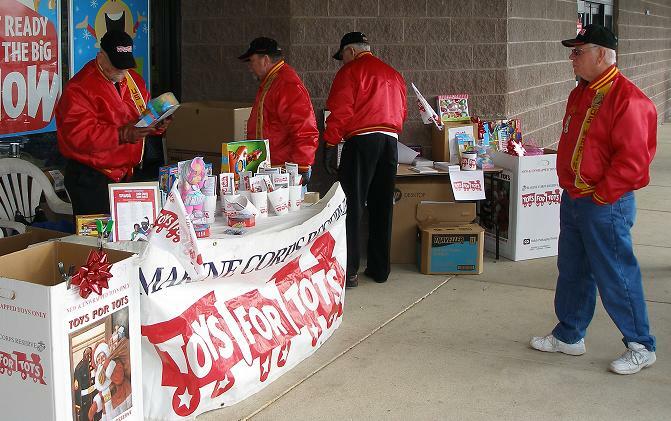 But when one talks to Dennis, the local organizer for Toys for Tots, he's got more business than he has had in years. The early requests from the organizations that he gets the lists of names of needy children from have already surpassed last year's numbers even before the Thanksgiving holiday. His only problem was filling the requests. The goal is for every child on the list to get "three toys" for Christmas. That number isn't set in stone, if one of the gifts is unusually large, they may get it and a 'stocking stuffer' type item, or if they have a lot of smaller toys, they may get several of them. But that's the target. And, you know Marines, they always aim at the target. To help meet that need the members of a local science fiction / community service / special interest "club" come together every year to put on what has become one of the largest one day events in the area to support the effort. And they have brought in everybody from costume-clad 'storm-troopers, to kids from a local high school, family and friends and co-workers, and whoever else they can get to help. This year, Delaware's Department of Technology and Information provided a box of fliers and handouts promoting keeping kids safe online. Something that is most certainly relevant to the holiday season. And nothing was wasted, any of the booklets and handouts that were left at the end of the day went to a local Boys and Girls Club. As the day progressed there was some discussion as to how many of these events there had been. And there was much speculation as to the answer, with no firm conclusion reached. 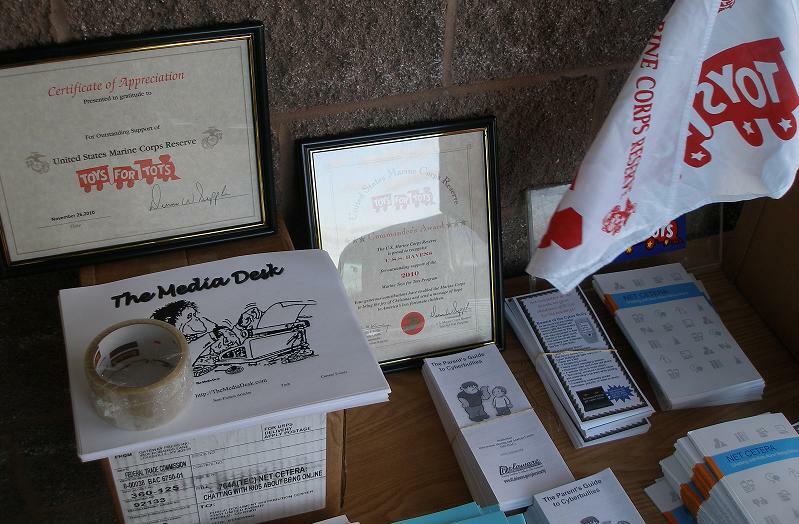 There is documented evidence online of a drive held in 2003 (see link below to the '03 and '06 photoessays! ), and everybody knows there were a couple before then, but nobody is sure how many. It could very well be that this was the group's tenth year. In any case, it has become a tradition. A tradition that will be moving from in front of Toys R Us to the North Dover Walmart next year due to some internal drama at the Toys R Us corporate office. 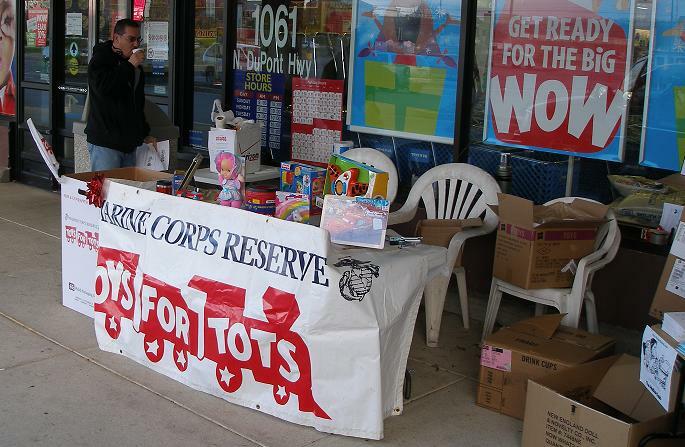 In spite of the fact that the vast majority of the toys donated to the drive being purchased inside the store hosting the event, and the good community relations generated by the event, and the free publicity enjoyed by the store as the event is promoted for a month or so beforehand and then mentioned afterward, the corporate office has seen fit to cancel any future "black Friday weekend" events, such as the toy drive, at their stores, nationwide. However, Wal Mart is more than happy to host it, so we'll see you there in 2011. And, as always, the Desk will show up with a pile of chairs, tables, boxes, tape, and bungee cords (yes, you need them! ), a jug of hot coffee, and do... whatever it is that it does. Overall, the down economy took its toll. In spite of beginning at 7 AM and running until 4 pm, only 210 items were donated. The Marine Reserve also collected cash donations of just over 250 dollars, with which they will purchase items for special needs children or other things not otherwise donated. But the Marines were grateful for the effort and all the donations anyway. See the coverage from the 2003 Toy Drive, with more pictures! And the 2006 story with pics!